Weighted blankets have become popular among both adults and children alike. They were originally made for children with autism to help them sleep better. With their plastic poly pellets or glass fillings, the best weighted blankets for adults induce a deep pressure therapy that is calming and sleep-inducing. If you are looking to buy one, this article would be a great starting point. 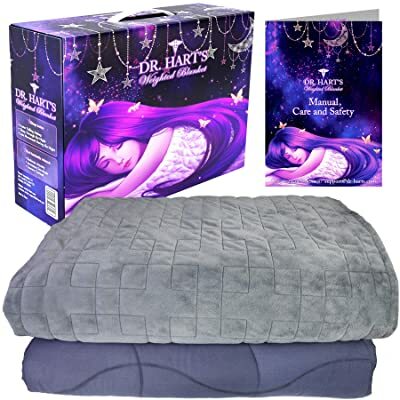 Dr. Hart’s Weighted Blanket is probably one of the best-weighted blankets for adults and kids alike. The deluxe set includes a micro-plush cover and a comforter to reduce stress through natural means alongside promoting deeper sleep. This product is made from odorless, hypoallergenic, and non-toxic quartz microspheres dream beads as the weighted material. This material of construction is great in a number of ways. First, it makes the blanket considerably thinner than some of the alternatives. Secondly, the material eliminates the shifting noise produced by some of the weighted fillings of some of the blankets. The quartz spheres also increase contact surface for a better sleep induction. 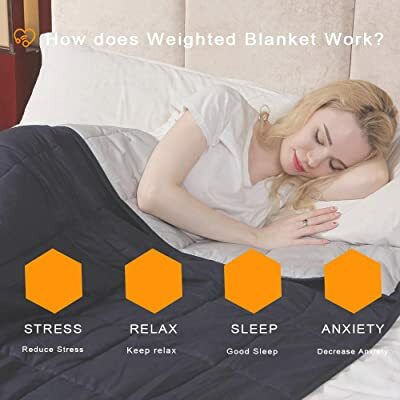 Measuring about 60 x 80 inches, this weighted blanket is large enough for a variety of users. Its removable cover can be machine washed for a continued luxurious feel. An inner blanket made of 100% cotton adds to the overall warmth retention. An array of blanket sizes is available for a varied number of user weights from under 100 pounds to those over 200 pounds. 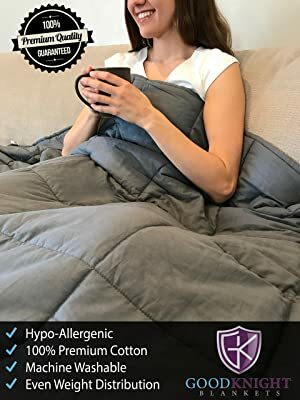 If you are in the market for a 15 pounds, 60 x 80 inches, queen-sized weighted blanket, then the YnM is one of the great options you may consider. It is filled with glass beads and a 100 percent cotton material. These materials are great for inducing sleep therapy for people with stress, autism, anxiety, insomnia or Attention Deficit Hyperactivity Disorder (ADHD). Although these options are available in a number of sizes, this particular one is queen-sized and weighs 15 pounds. This means that it is engineered for those weighing approximately 140 pounds. A 7-layer stitching system produces a weighted blanket that seamlessly conforms to one’s body without leaking glass beads over the duration of use. To make it easier to clean, there is a removable duvet cover which can be bought separately. The noise produced by glass beads during shifts is prevented by having the beads sewn into separate compartments. This design is also great as it evenly distributes the blanket weight over the user. Just as a precautionary measure, ensure either an adult or a child can move the blanket off themselves as they can be quite heavy at times. Besides making weighted blankets for kids with autism, Quility also makes premium blankets for adults. This particular option measures 60” x 80” and weighs 15 pounds, making it an ideal choice for those weighing between 120 and 180 pounds. If you match these specifications and are looking for a therapeutic blanket, then this might be an excellent option. There are plenty of colors to choose from. You could opt for one that is grey, navy blue, blue, and ivory with alternate cover patterns. The outside cover provided alongside the blanket is made from 100 percent cotton. On the other hand, the blanket itself is filled with non-toxic, hypoallergenic glass beads fitted in polyester pockets to keep them from moving about. Each of the blankets comes with a comforter made from polyester. It is soft to touch and is fixed into the blanket using 8-string ties. When you feel too hot especially in summer, you simply remove the comforter cover. Not only is this great for sweaty sleepers, but it also makes the blanket easier to keep clean. 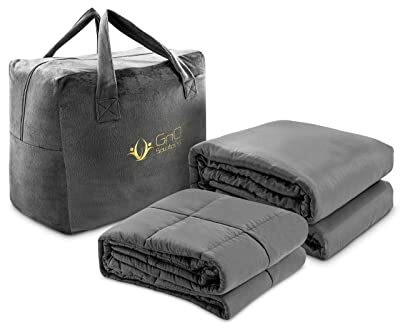 The GnO solutions cooling weighted blanket is an “all season” gravity induced blanket to ease sleeping problems. If you fall into the category of those whose body weights necessitate a 20 pounds weighted blanket, then this would be great for you. Its queen size 60” x 80” makes it great for both adults and children. As part of the package, you get a 100% bamboo duvet cover for the blanket. This fabric makes the blanket hypoallergenic, non-toxic, and eco-friendly. There exist a 15 pounds weighted blanket alternative for those who need it. The use of breathable fabrics provides for a blanket you can use in winter for coziness and summer for keeping cool. Better still; the blanket itself is made from 400 count thread cotton. It results in a plush, premium feel fabric that is cozy on the skin. For the filling, hypoallergenic small glass beads are used. These exerta decent amount of weight on you for a better sleeping sensation. When you purchase this blanket, it comes with a plush minky grey presentation bag. The good Knight Weighted blanket is designed for those experiencing conditions such as stress, anxiety, autism, and attention deficit disorder (ADD). If you suffer from any of these, or if you are having trouble getting adequate sleep and weigh between 120 and 170 pounds, then here is a great option. It has a total weight of 17 pounds making it one of the ideal options for this weight bracket. At an extra-large size of 60” x 80”, the blanket is meant for both adults and teens up to 6’6” in height. In order to feel hugged by the weighted blanket, it is critical that you do a correct sizing in terms of height, your weight and bed size. You would want to have most of the blanket weight on you and not the bed. The blanket is made out of 100% cotton for a premium natural fabric feel. Tiny poly-pellets fill each square pattern on the blanket to generate the weighted property of the blanket. The squares are then sewn tight to eliminate potential weight shifts when the blanket is moved. Unfortunately, a duvet cover is not included in the package. For adult men and women weighing over 230 pounds, the Weighted Idea Weighted Blanket is a great solution to your sleeping problems. With its sand-sized pellet fillings, this weighted blanket gives you the sensation of being hugged. Three other sizes are available, but this one is for queen sized beds. At 25 pounds in weight, users do not have to choose oversized blankets to meet their body weight requirements. Square pockets firmly hold the pellets in place for a uniform weight distribution when sleeping. Therefore, the blanket can be used for a couple of other purposes other than sleeping. It could be reading, meditating or just relaxing. In as much as this product is made from premium cotton fabrics with cotton fillers in between, it still doesn’t provide sufficient cooling capabilities. Either a fan or an air conditioner is, therefore, recommended for hot sleepers, more so in summer. Since no one likes waking up to a mess of pellets, an extra lining is added to the blanket to keep the pellets in place. The Hypnoser Weighted blanket is available in a range of 8 different weights. These range from 3, 4, 5, 7, 10, 12, 15up to 20 pounds. Such extent of availability is great for a whole family use for kids, teens, and adults. Perhaps of interest might be this product that weighs 15 pounds. It is ideal for adults (even teens) weighing between 100 and 150 pounds. The blanket is made from 100% cotton, making it both cozy and breathable. Inside of the layers of fabrics are some glass pellets. These are hypoallergenic which is great if you have a sensitive skin. Glass pellets also tend to be good at providing a cooling sensation than plastic pellets. 4” x 4” diamond pockets house these pellets to create the same weight throughout the blanket. And to prevent the glass beads from spilling out, reinforced threads line the seams on the pockets. Keep in mind that there no cover is included in the package so you’ll have to buy it separately. That is if you want to make it easier to clean the blanket itself. The exact measurement for this weighted blanket is 48” x 72”. Ensure your bed is this size for effectiveness. Featuring a 100 percent glass beads weighing system, the Platinum Health weighted blanket provides a comforting, relaxing sleep. This weighting system combines a CloudSoftPolyfill and a Stardust Mini bead technique for a comfortable weighted blanket. 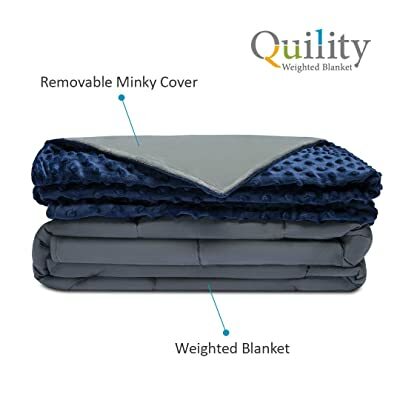 One of the unique features of this weighted blanket is the luxurious Minky cover. It has different sides, one being a soft, silky one, while the other side has a SensaCool dot design for a cooling effect on users. Of course, these sides are reversible as you wish. Another noticeable feature is the lack of squared stitches housing the weighted fillings. Instead, a cover is placed over the stitches to hide the lumpy pockets. A uniform blanket results in the process. A 2-part construction system includes an outer cover and the weighted blanket. With the cover, which is part of the package, it becomes easier to take care of your blanket. Size-wise, this product measures 60” x 80”. It’s a great size since it ensures the maximum body to blanket contact. Such contact eliminates blanket slippage as you turn in bed. By promoting the production of melatonin as it applies pressure on your body, weighted blankets help you sleep better. Melatonin is a hormone produced naturally by the human body to trigger your sleep cycle. Another hormone, the “happiness hormone” brings a calming process during the course of the production of melatonin. These blankets are, therefore, designed to be slightly heavier than duvets, quilts, and standard comforters in order to achieve this function. Since numerous options are available, and not all will work out for you, there needs to be a careful consideration before you make a purchase. Features vary from model to model, just as the pricing. 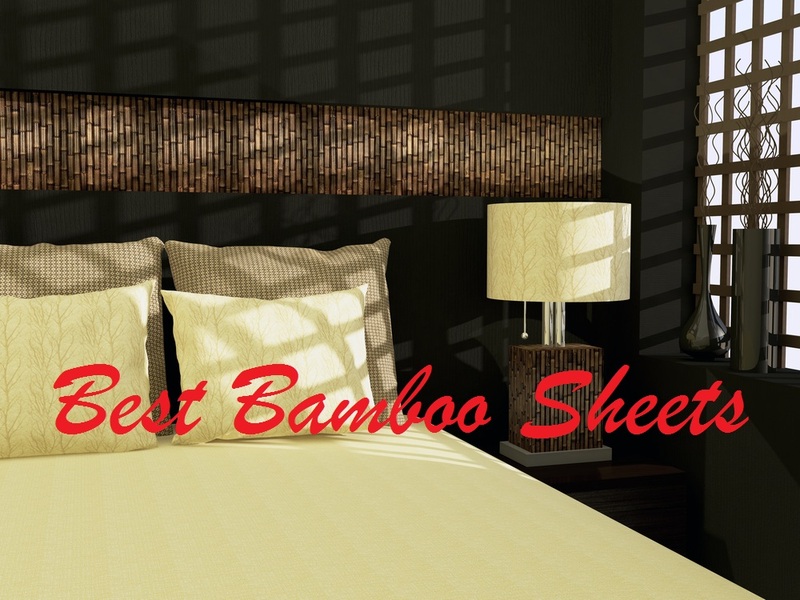 Here is a buying guide to help you settle on the best option for your sleeping preferences. Just like any other item, weighted blankets are availed in all sorts of sizes. There is queen, twin, full, and many others. Most importantly, the size of the weighted blanket relative to your body and bed size determines how effective it would be. Here is the deal, weighted blankets are meant to cover the top of the bed. It shouldn’t hang over the sides. If it does then as a result of the weight, the blanket slips down as you turn and toss in your sleep. Before you buy any weighted blanket, check its size and whether it matches your bed. If you do this, you would end up with the most effective blanket around. From the name, the weight of the blanket is a critical aspect. Or else, it would be just like any other ordinary blanket or comforter. A typical recommendation is that the weight of any product should be 10 percent of your body weight plus a pound for maximum effect. Too much weight overstimulates the body and can cause injuries in addition to the increased difficulty of moving it around. Majority of the weighted blankets we have here weigh between 12 and 15 pounds, which is the most ideal. A heavy weighted blanket is also less breathable as compared to a lighter one. Sleeping in one in summer makes for an uncomfortable sleep. Nonetheless, they are great for winter. Lighter blankets are breathable, great for summer, but less efficient in heat retention. Another trend is to design a “one size fits all” kind of weighted blankets. These are typically the best-weighted blankets for adults. They are designed in a way that weight redistribution is done by folding the blanket in certain ways, making them fit for kids, teens, and adults. Most manufacturers prefer cotton fabrics to others in the construction of weighted blankets. Cotton, as a natural fabric, is breathable, cool, non-irritating, and generally safe. A blanket made from high thread count cotton is quite durable too. There are other options available such as viscose and bamboo. These offer almost the same properties as cotton, albeit with a minor difference. So long as it is hypoallergenic and non-toxic, then the type of fabric is a simple matter of preference. Newer entrances include minky and fleece. These two are inexpensive, easy to clean, and durable. The same goes for the blanket cover. Natural fabrics are more breathable but more expensive. Synthetics such as polyester are cheap but are typically less breathable. First of all, the filler used inside your weighted blanket has to be BPA free and approved by the FDA. As far as materials are concerned, there are different options. Some of the most common fillers used are rice, plastic pellets, glass beads, sand, beans, and poly-fills. Of all of these, it’s the plastic pellets that are the easiest to clean, while the glass beads provide the least amount of filler noise. These fillers have to be properly sewn into place so that they don’t shift their weight when in use. In order to ensure you don’t wake up to beads or pellets all over you, look for blankets with outer seams that hold the fillers in place. Extra layers weighted blankets tend to be the safest choices for this. Cleaning your weighted blankets is a must after a while. Some are easier to clean, while others, not so much. Look out for the recommended mode of washing the blanket. While most of these will be machine washable, dry cleaning is preferred. Machine deteriorates the quality over time. To reduce the frequency with which you’ll be cleaning the blanket, ensure you have a fabric cover. There are products that do not have these included in the package, meaning you have to buy them separately. Sometimes a product may have good reviews, but when you use it, it doesn’t work out for you. At such a time, you should be able to return the product to the manufacturer and be refunded or given one that works as you expected. Usually, this should be in about 30 days’ time. The product warranty is another testament to product quality. A longer warranty provides the guarantee of quality. It would also save you money in case you need to repair the product. A weighted blanket is an essential sleeping gear, more so when you have a condition that makes it hard for you to find a refreshing night’s sleep. It even becomes therapeutic in a way. While their benefits remain undisputed, finding the perfect one for your needs is the actual challenge. We hope our reviews and buying guide have made it easier for you to settle on the best option. 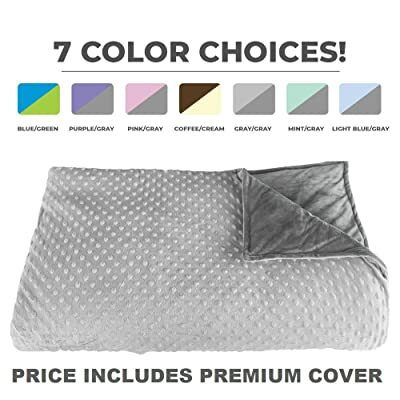 Of the 8 best-weighted blankets for adults that we have reviewed, we think Dr. Hart’s Weighted Gravity Blanket Deluxe Set is the best one. It weighs 15 pounds, which is neither too heavy for breathability nor too light for warmth retention. Measuring queen size, the blanket fits perfectly on most of your beds without hanging on the edges. A quart filling eliminates noise while increasing contact surface with one’s body. With an inner blanket made from 100 percent organic cotton, the blanket is easy even when rubbed on the skin, is machine washable, and hand washed. An alternate plush cover is also provided to reduce your cleaning frequencies. All of these features fit into the selection criteria, which makes us believe that this is probably one of the best-weighted blankets out there.